The cadastral fabric is built on the survey measurements without loss of any information. ArcGIS Survey Analyst helps compile survey plans of different ages, dimensions, and orientations. Cadastral Editor tracks parcel history and linage by maintaining the legal recording dates. The New South Wales (NSW), Australia, government owns and operates the electrified metropolitan railway network throughout Sydney and surrounding commuter areas. As the population of Sydney has grown outward into new areas of urban development, the government has recognized the need for major upgrading of parts of that system. The NSW Transport Infrastructure Development Corporation (TIDC) was enacted to focus on the construction of major projects to facilitate those upgrades. This shows the process of "joining" the geometry of a new parcel to the existing survey data geometry model. One such project involved the upgrade of 10 kilometers of an existing single line that serviced a historical rural area identified as a major growth center for Sydney's future. To commence the planning and design stage, the project needed a survey-accurate cadastral model of the route, and it was also preferred for political reasons that this be done initially with a minimum of survey fieldwork. TIDC recognized the innovation of the cadastral modeling technology and skills of Australian Esri Business Partner Geodata Information Systems and engaged it to prepare a survey-accurate cadastral fabric of the railway corridor. Geodata worked in conjunction with the Sydney office of the engineering project managers; surveyors; and the engineering and management firm Connell Wagner, which uses Esri software. As a "big picture" government infrastructure developer, TIDC envisioned that when it completed the construction stage of the project, the firm would provide the railway operations department with a valuable database of the highest spatial quality for ongoing asset management. This cadastral fabric is a topologically integrated geodatabase dataset designed to store a continuous parcel fabric to cover a certain jurisdiction. 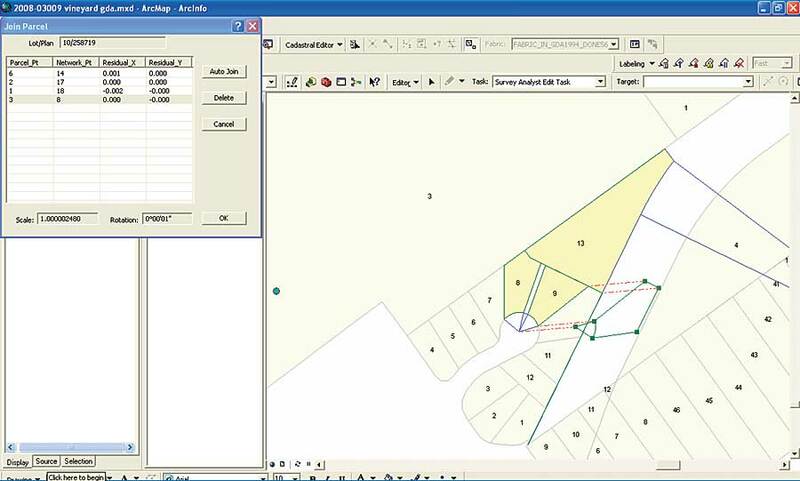 The ArcGIS Survey Analyst software's new cadastral fabric dataset is built on the survey measurements from TIDC subdivision plans and geodetic survey control without loss of any information from the original survey records. The dataset includes parcels, boundary lines, parcel corners, and control points. The underlying technology for the cadastral fabric dataset and the new workflow Cadastral Editor is Geodata's GeoCadastre, a survey software that has been in development for the last 20 years for a user group of Australian companies and utilities. The overall layout of the 10 km route containing more than 4,000 parcels. 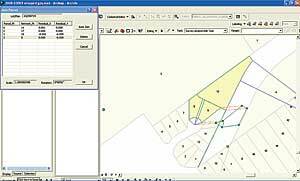 Using Cadastral Editor, individual TIDC parcels and subdivisions are entered using coordinate geometry (COGO)-based plan entry. The integrated cadastral fabric is developed from all relevant survey and plan data using least-squares adjustment for the best-fit representation of the parcel layer. Cadastral Editor also tracks parcel history and linage by maintaining the legal recording dates. Existing databases can also be imported electronically, but that process does not utilize the full rigor of the survey processes within Cadastral Editor. As each new parcel is joined to the survey data model, the accuracy of the fit is also measured, checking the spatial quality of the new data and providing another level of survey rigor. The data is then adjusted using least squares. The adjustment report compares all the computed lines with the original measurements. If the residuals are large, it usually indicates a problem with the plan, and additional field survey definition on the ground may be needed to properly isolate and address these apparent inaccuracies. The plans concerned have generally been given a weighting that either removes them from the least-squares adjustment or substantially reduces their impact such that their overall effect on the model is negligible. The electronic compilation is based on the intuitive method a surveyor would otherwise manually undertake to create a cadastral database. Model accuracy is directly related to the quality of the survey information available (e.g., in a new subdivision, the model accuracy would be 2030 millimeters). Prior to data entry, it is difficult to gauge the quality of the survey data. In the TIDC model, a reasonable length of the route corridor is adjacent to urban areas, which led the project team to believe the survey information would be reasonable and would not require a significant amount of extra field survey control. 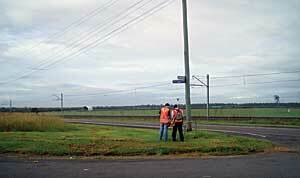 Capturing survey information for NSW's upgrade of a portion of its electrified metropolitan railway network. More than 4,000 parcels were entered to provide a rigorous model for the adjustment. In the model area, more than 130 coordinated survey control marks with survey connections to the cadastre were found in the NSW Lands Department Survey Control database. The coordinates of approximately 90 of those marks were of the highest accuracy and considered suitable to be used as accurate control for the adjustment. Following completion of the desktop model, the surveyors undertook two days of fieldwork in several areas where properties were defined by older survey plans and required more definition. Cadastral survey marks, including pegs and reference marks, were located and coordinated by GPS. On one field day, the model was taken into the field with GPS; the desktop model coordinates allowed surveyors to navigate accurately (0.050.5 meter) to where marks on the ground or buried marks were located. In many cases, the model quickly allowed recognition that survey marks had been destroyed by cables or other work. The survey connectivity and rigor of the desktop data allowed the model to be created and adjusted with only one extra survey field control mark being necessary. In the final model, 16 control points were held fixed with the remainder assigned a "not active" status to provide independent verification of the model's spatial quality. The spatial accuracy of the final TIDC model is in the order of 30100 millimeters in urban areas where reasonable survey information is available and 100200 millimeters in rural or other areas of older survey plans where there is limited survey information. 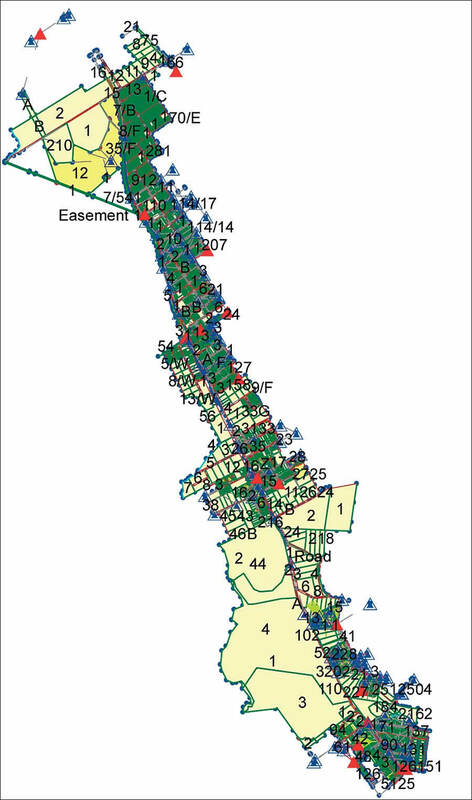 The project now has a survey-accurate cadastral database with property attributes to underpin the project GIS database in the ArcGIS environment. "It is important that this valuable dataset is correctly maintained for the duration of the project and to pass it on as a legacy for future operational efficiencies and asset management," says Ian Harper, surveyor, Geodata. "You cannot quantify the true value of such an asset for the future. Unfortunately, people who have had to deal with spatially poor GIS databases in the past are the only ones who truly recognize the value." The NSW Lands Department is promoting permanent global navigation satellite system base stations, such as the Continually Operating Reference Station (CORS), across the state. These stations will provide surveyors with centimeter geodetic accuracy for all their measurements in the near future. "The cadastral layer in the geodatabase is the only way we can meet the spatial challenges of both survey and GIS professionals today and in the future," concludes Harper. For more information, contact Bryan Jones, property manager, TIDC (e-mail: Bryan.Jones@tdic.nsw.gov.au), or Ian Harper, Geodata (tel. : 61-412-453170, e-mail: harper@geodata.com.au).